PORTLAND, Ore. — The Association of Partners for Public Lands (APPL) presented its 10th annual Media and Partnership Awards at an evening ceremony on March 13 at the DoubleTree Hotel in Portland. Awards were presented in 12 categories honoring achievements in publishing, product development, and programming by nonprofit public land partner organizations. Manzanar History Association’s “Children of Manzanar” was honored as the 2013 APPL Excellence Award winner. 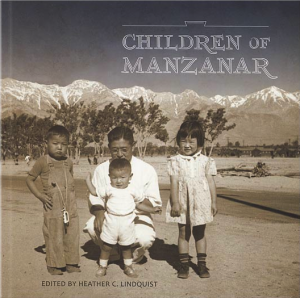 “Children of Manzanar,” the winner in the children’s media category, was chosen for the top honor among all entries in 12 categories for exemplifying the qualities of a truly collaborative project. It involved a variety of partners working to produce a product of exceptional value to the interpretation and understanding of a public lands site. It was recognized for its creativity and unique perspective through the use of first-person accounts of the lives of Japanese American children held in internment camps during World War II and its use of pictorial elements to accompany the text. Furthermore, the judges were impressed with the quality of the book, noting that its publisher is also a nonprofit organization. The book’s focus toward a young adult audience was especially appealing. Contributors to the production of this outstanding publication included: Heather Lindquist, editor, Harvest Moon Studio; Maggie Wittenburg, executive director, Manzanar History Association; Rose Masters, researcher, and Alisa Lynch, chief of interpretation, Manzanar National Historic Site; Arthur Hansen, professor emeritus, CSU Fullerton; Malcolm Margolin, publisher, and the editorial staff of Heyday Books. The Media and Partnership Awards recognize the outstanding contributions made by nonprofit partners to engage the public with the nation’s parks, refuges, monuments, forests, lakes, open spaces, and historic places. Following are the evening’s honorees. The 2013 Awards Bulletin listing all of the winners and honorable mentions as well as a list of the 19 volunteer judges may be found here.